This week has been tough. I’m two weeks into my 8 week sugar-detox and it’s starting to bite. Week 1 felt relatively easy, I was focused, motivated and in high spirits about my challenge. 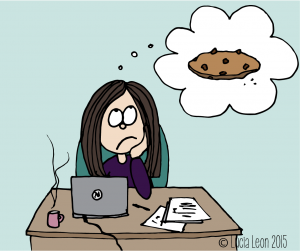 As this week has passed, I have felt increasingly distracted (mostly by thoughts of triple chocolate cookies) and although I have remained committed to my detox, the cravings and temptations have been pounding at my door. What’s more, the programme I’m following requires me to go cold turkey from tomorrow. The first couple of weeks have been about cutting back on sugar and adding ‘good fats’ into my diet, the next few weeks are about quitting all sugar….no fruit, no honey…the whole shebang. The rationale for this is to allow your body to re-calibrate before gradually reintroducing a little sweetness (not sugar) back into your diet. By this point, I am starting to panic. Is this something I really want to do? Why do I have to give up all of it? Why did I have to go public with my challenge? I am definitely starting to doubt my capacity for change. Can I really do this? What does a ‘little bit’ of sugar hurt me anyway? What if I ‘fail’ and look stupid? Who really cares anyway? I have realised in these couple of weeks that I have a pattern when it comes to trying to change my diet. Week 1 – I’m on a roll, it’s all good. Week 2 -it’s getting tougher but I convince myself I’ve done so well for the last two weeks that by the weekend, I surely deserve a little treat. And game over. The cycle of sugar-fixes, disappointment, guilt and general ‘bleurgh’ before the wanting to change starts again. Undoubtedly, if I hadn’t have dedicated this round of sugar-detoxing to Kairos WWT, and made a public statement of my commitment, I would have relapsed this week for sure. What has also helped are the family, friends and colleagues who have checked in with me, expressed an interest, asked how it’s going. You cannot underestimate the power of positive people and their support when trying to beat an addiction. 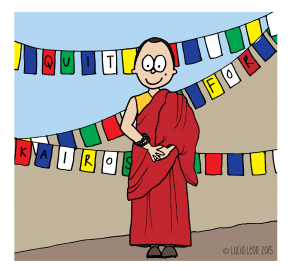 I was touched to be joined by my brother, a Buddhist monk currently living in Nepal, on my #QuitForKairos campaign. There’s little left that he hasn’t already giving up on his own spiritual journey, so his willingness to give up chocolate for the next 6 weeks with me was a real boost. Of course, with every day that I’m on this journey, my thoughts are with our service-users. I try and understand their battles with addiction from a more personal place. I start to appreciate, more than ever before, the pull of an addiction, the internal battle that takes place many many times a day, the physical craving that overpowers the fragile mental will, the cloud of self-doubt that threatens a storm, the sense of aloneness that is attracted to the comfort of old habits and securities. My battle is being played out in a stable home, with a solid support network, where love is abundant and my life secure and fulfilling. Strip me of those shelters, and I guarantee that the persuasive call from my nemesis, would not go unanswered. You can join me at any time over the next 6 weeks and believe me, you’d be helping me out if you did. There’s nothing like solidarity to get through a challenge. And this, for me, really is a challenge.